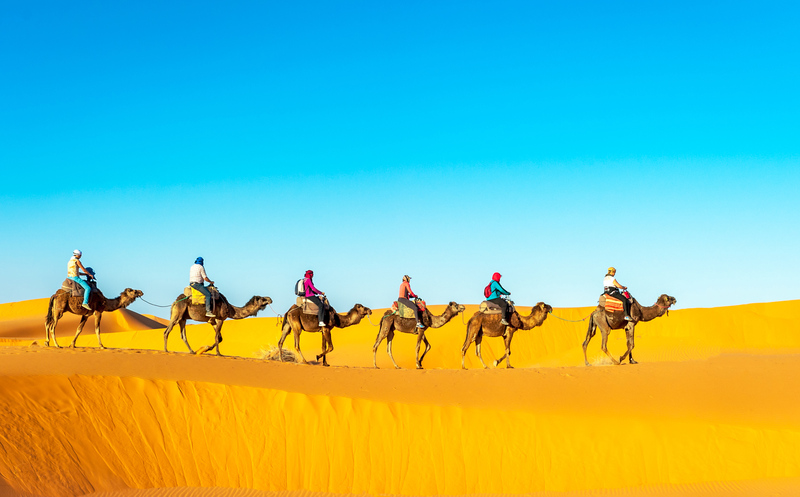 A private 11-day, 10-night family trek to Morocco’s high peaks, endless deserts and spectacular cities. In the outskirts of Fes, embark on quiet morning hike and intimate picnic lunch on Mt. Zalagh. An afternoon souk food walk through the medina with your local food guide will let you learn about the many delights of Moroccan gastronomy. Step outside of Fes and explore the nearby ruins of Volubulis. Another delicious picnic lunch will accompany your breathtaking view. Return to Fes for a traditional Moroccan tom-tom drum making experience. Learn the basics of drumming while a master drum-maker crafts your personal instrument. Hike into the lush, green mountains (accompanied by support mules) and have a picnic lunch under the open sky. Spend the morning preparing a traditional Moroccan lunch with the help of your local culinary expert. If you’re not too stuffed after lunch, design your own Kaftan to fit your personal style. Highlights of your day: explore the colorful souks (marketplaces), the trading centers of such exotic goodies as spices, carpets, jewelry, copper, hand-made rugs and much more. Tonight, indulge your last cravings for Moroccan food at a private dinner party to celebrate the last evening of a wonderful adventure. • Hike and lovely picnic lunch on Mt. Zalagh (Fes). • Souk walk guided by an expert on Fes’s finest tastes. • Picnic lunch overlooking the ruins of ancient Volubulis (Fes). • Lesson in making a traditional Moroccan tom-tom drum (Fes). • Hike in the High Atlas Mountains with local guide, support mules and picnic lunch. • Hands-on cooking lesson with a talented Moroccan chef (Marrakech). • Create your own personalized Kaftan with local craftspeople (Marrakech). • Luxurious farewell dinner to send you off in style (Marrakech).